Maintain healthy teeth and gums for a lifetime. 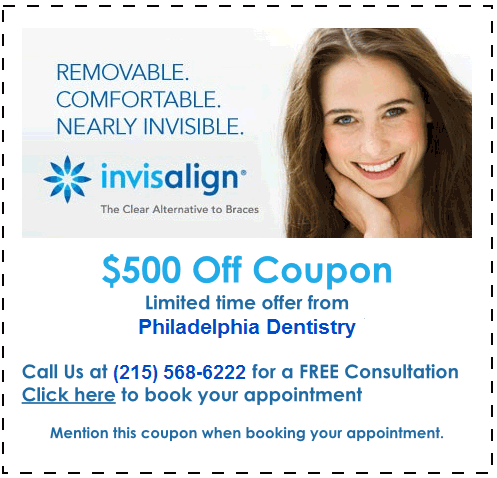 It is our goal to make you feel comfortable and at ease during every visit to our Philly Dentistry office. We understand that some patients have anxiety about going to the dentist – but avoiding the dental chair because of nerves can lead to serious oral health problems. Trust in the friendly and relaxing atmosphere of our office and caring staff, especially Philadelphia dentists Dr. Ken Cirka, Dr. Jessica Meier, Dr. Mimi Jeon and Dr. Stephanie Smith who are known for their kindness and extensive dental experience. Learn more about our Dentists & friendly Staff. Misaligned teeth not only interrupt your smile, they contribute to oral health problems like tooth decay, TMJ, and enamel erosion. Through Invisalign, adults can achieve the straight teeth they want without anyone knowing that they’re undergoing orthodontic treatment. Invisalign aligners are practically invisible. Plus, Invisalign is affordable, comfortable, and has no food restrictions, so you can still enjoy your life as-is, just with straighter teeth. Dr. Cirka is a certified “Elite Provider” of Invisalign. Only about 1 percent of Invisalign providers nationwide have the Elite designation. This title speaks to Dr. Cirka’s extensive case experience and extraordinary level of Invisalign success. Learn more about Invisalign in our Invisalign FAQ. Porcelain veneers are one of the most versatile cosmetic dentistry treatments available. If you have chipped, cracked, stained, gapped, short, uneven, misaligned, or worn teeth, porcelain veneers can correct these problems all at one time. In just two visits to our Philadelphia dental office, your smile can be made new again with flawless, natural-looking, durable, long-lasting porcelain veneers. Get answers to your questions about porcelain veneers. Patients who pursue smile makeovers do so not only to enhance the appearance of their smile, but to improve functionality. Crooked, crowded, or poorly shaped teeth can lead to an increase in gum disease, bone deterioration, and even the risk of heart disease and diabetes (yes, your oral health absolutely affects the rest of your well-being). A fully functional, gorgeous smile is within your reach. Your Philadelphia dentist will customize a smile makeover plan for you to correct your oral health concerns, while also addressing aesthetic complaints. We want you to be confident about and proud of your smile. After all, your smile can impact everything from success on the job to success in love. When you get a smile makeover, you will look happier, healthier, smarter, and far more approachable. Learn more about our Smile Makeover service. Friday – 8 a.m. – 1 p.m.
Read our testimonials & view the Smile Gallery. All the dental services we offer. What patients think of our practice. Our fees, dental insurance, and financing options. Read about our Dental Insurance & Easy Financing options. We strive to exceed your expectations at our Philadelphia dental office. And your satisfaction is guaranteed. By offering the finest service and using modern techniques and innovative materials, we take care of and enhance smiles so they will last for a very long time. We understand you may have reservations about visiting the dentist, but you deserve good oral health. Don’t let anxiety stand in your way of healthy teeth and gums. Our friendly and relaxing office atmosphere will help you feel secure. Visit Philadelphia dentists Dr. Ken Cirka, Dr. Jessica Meier, Dr. Mimi Jeon and Dr. Stephanie Smith for kind, gentle, caring dentistry.